I had heard that the first mile was relatively easy with some parts being moderate, and that the last half was more, well, difficult. Anyway, we marched on. We crossed a number of wooden bridges crossing large rocks and a creek that wasn’t quite full. However, it was beautiful. There was still plenty enough water to go and splash around in (or test out if my boots are really waterproof… but that’s for another time…) We passed lots of people; adults, teens, kids and even toddlers. More than once I saw a small child in a carrier. We got to a point a good ways up and then we were actually headed down hill. I knew that we were close now based on what I had heard others saying on the way up. And sure enough we were. I could tell that we were on the top now because there was hardly no more mountain to look up to. We came to a spot where people had gathered. I noticed it was at the base of a large rocky wall. Some were climbing, or maybe I should say scaling this wall to summit the top of the Chimney’s. I knew I had to do this! My wife found her a spot at the base and a woman to talk with as I climbed to the top. So, up I went. It was awesome. So far I have not done any “hiking” such as this. This was so cool, and I felt like a kid again, playing on a large rock pile. I quickly made it to the top, wishing that the rock wall were higher so that it wouldn’t have ended so quickly, but also breathing in the sweet smell of complete victory. There I stood on top of the Chimney’s at 4,840 feet. Now I was looking down to the road I drove up to reach the trail head on, rather than staring up at the Chimney Tops. It was grand. So, I made my way back down and my wife and I made the steep hike down. Now it was us looking at the ones coming up, with the look of victory on our faces. The hike down went very quickly. The trail was so steep that most of the way down we had to hold ourselves back from running down the trail. But we made it, and now I can remember the time that I stood on top of Chimney Tops. So, we loaded back up in the truck and took the road back towards Gatlinburg. We were going fine for a while but just as we neared the Sugarland’s Visitor Center, the traffic came to a complete stop. We have been in quite a few large traffic jams since last night, so this one didn’t surprise us, however that didn’t necessarily make it any better either. I got out and walked to the Sugarland’s Visitor Center and bought some things and tried to figure out what the deal was and they told me it was because of a “Dukes & Hazard Parade” that was going through the town. Finally the traffic moved along and we made our way back to Gatlinburg and then stopped at the NOC. And would you believe that as we were leaving we got stuck in the NOC parking lot by the same parade! So, this was our day and our day hike to the Chimney Tops. Thanks for reading. 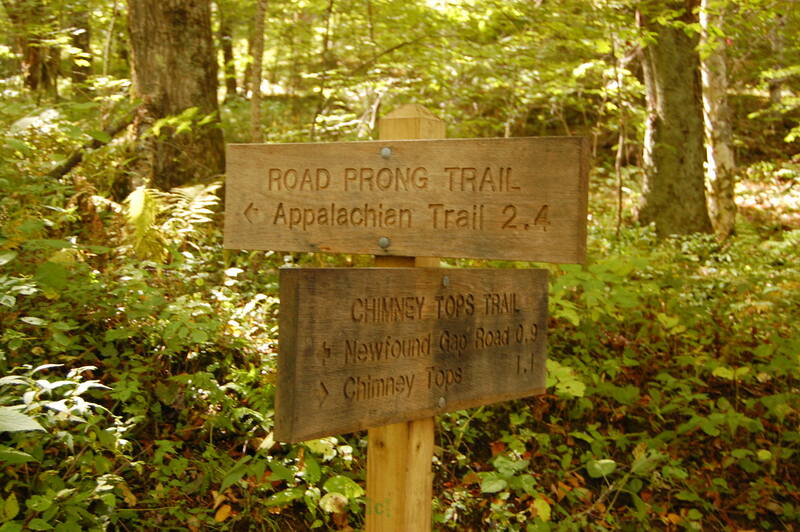 This entry was posted in The Trail, Trip Report and tagged Backpacking, Chimney Tops, day hike, Gatlinburg, GSMNP, Hiking, Smokies, Trail. Bookmark the permalink. Thanks for sharing can’t wait to see more details and your gear list. Thanks for the great blog about your trip, and thanks for the Camera advice on the Backpackers Forum. What a great victory for you! That is AWESOME.